Seeing this photo of stuffed pasta while listening to the song Belle by Jack Johnson has me escaping to the streets of Italy, smelling fresh bread and imagining fine wine—then Pandora radio quickly changes tunes and I snap back to reality. 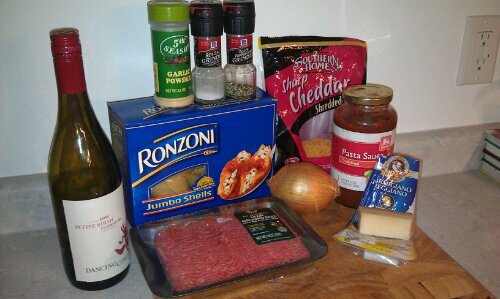 Ground beef, Parmigiano-Reggiano, red wine and pasta are staple ingredients I always have on hand. With only a few ingredients, this recipe packs a nice punch and comes together quickly. It’s also versatile. Feel free to change up the ingredients and substitute them with items from your pantry! Brown the ground beef and onion, season with salt, pepper and garlic powder. 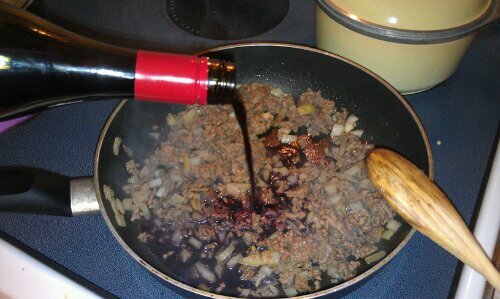 Then, deglaze the pan with a good quality red wine. 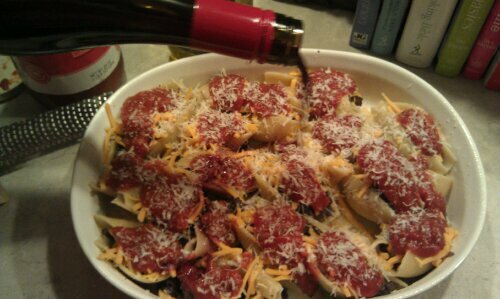 I’m using Dancing Coyote’s Petite Sirah. It’s a full-bodied, dry wine that’s full of flavor…one of my favorites! 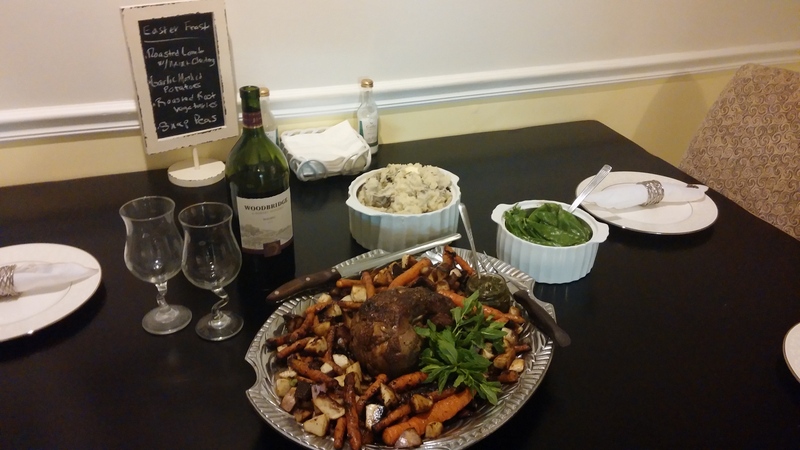 Always cook with a wine you enjoy drinking. Cook pasta according to package directions and drain. 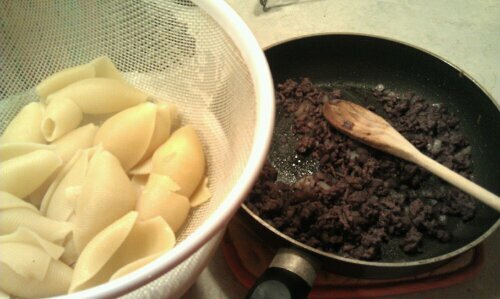 I like to add salt and olive oil to the pasta water for added flavor. Then set up a little stuffing station. 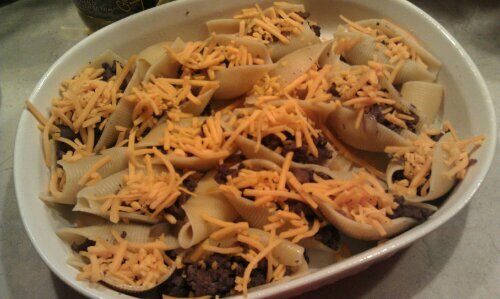 Stuff the pasta with the ground beef mixture, then top with sharp cheddar cheese. Sharp cheddar gives it a nice bite. 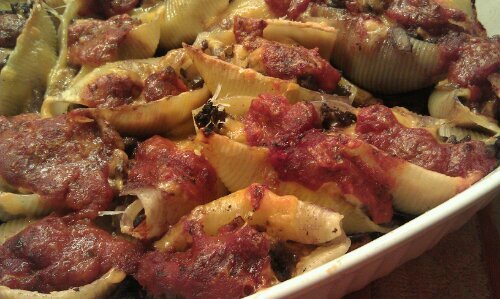 Cover the stuffed pasta with a jarred tomato sauce, then grate fresh Parmigiano-Reggiano right over the top of the dish. Drizzle with olive oil and splash with another drink of red wine. This will help the pasta to stay moist during the cooking process. Bake at 400 degrees for 20 – 25 minutes. Tell me about your best pasta dish!